In the midst of the holiday season, it’s easy to get carried away with all the festive parties, gift shopping, and places to be. But we often forget the true meaning of the season – spending time with our loved ones. Whether you’re recently married, a child of five, or the grandparents to young children, embracing holiday traditions that are special and unique to each person or family is the gift that keeps on giving. If your family traditions are decades old, or even new this year, keeping the spirit and joy of the season is an important task. Although your traditions may seem outdated or tedious, keeping them alive reminds us of the love and fun we have together when it comes to being with friends and family. So put on your Santa hat, get out your Elf on the Shelf, and get the cookie sheets ready, we’re going to help spruce up your holiday traditions that your family will embrace for years to come! Although it may seem like a simple task for some, decorating a tree is a perfect way to bring the family together. Head to your local Christmas tree farm to pick out your favorite tree, and get out those ornaments to make tree trimming fun and festive. Do your ornaments have a unique story? They’re the perfect storytellers to new members of the family or friends stopping by. Whip up some hot chocolate, blast those Christmas tunes, and get decorating! Not having a Christmas tree isn’t the end of the world. 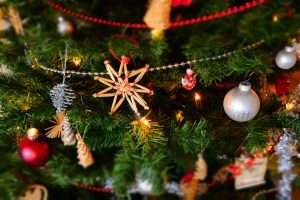 Travel, work, and lack of time can get in the way, but there are other festive ways to celebrate Christmas without having a physical tree in your house. You may ask, ‘but where do I put the gifts?’ Make it a game by present hunting! Hide your gifts throughout the house and have a Christmas hunt in the morning. Don’t forget where you hid all the packages though! A classic and popular tradition, matching pajamas is a fun way to act festive and joyful with your family. Whether you buy cozy onesies, ugly sweaters, or soft tee-shirts, matching your family members creates a warm and snug holiday tradition that will create lasting memories. Don’t forget to snap a photo – how often does your family match! Did you know Santa’s diet consists of cookies only? To fuel his long journey on Christmas night, it’s imperative to leave out cookies and milk before you head to bed. Begin this time-tested tradition with your young kids that will keep them believing for years to come. Plus, baking as a family brings you closer together. Make sure you set aside a few cookies to enjoy on Christmas Day! Does it seem like your house is stuffed with toys at times? Make room for Santa’s new collection this year and donate past toys your children no longer play with. Bring your kids along to help teach them the importance of generosity and giving back to the community. Find a local organization or charity that collects new or used toys this holiday season. Even better, start your own toy drive! The holiday season is all about creating memories with your loved ones. The Degnan Group will help you find the perfect home to create long-lasting traditions that will stand the test of time. Contact us today at (419) 345-7808 to get started.